【Healthier Gums and Brighter Teeth】With high pressure water pulse 1700 times per minute, 360° rotating long nozzle,The water flosser can deeply cleaning every corner precisely that traditional brushing can not reach,removes stains and discoloration from the surface of your teeth to significantly whiten and brighten your smile. 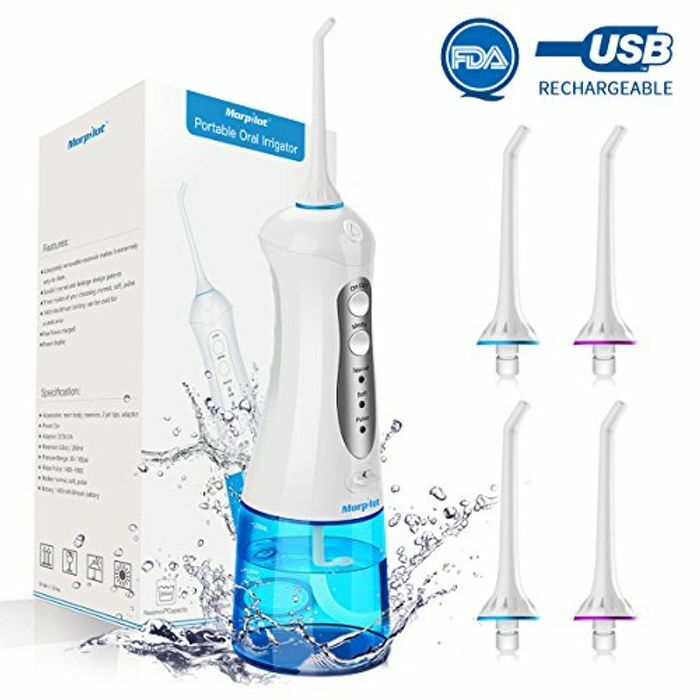 【3 Flossing Modes with Memory Function】Normal--Standard mode, Soft--Getle mode, Pulse--Massage mode is selectable for different oral care needs,personalized care dental jet cleaner.The cordless dental water flosser have memory function helps you keep on with your preferable mode for next use even if the electric water flosser has been turned off. 【Cordless and Portable】Small size, portable lithium battery charging design, 1400mA rechargeable battery, charging 4 hours can be used 7-10 days, suitable for travel use;USB charging jet teeth washer:support power adpter, computer, car charger, power bank charging. 【Easily Cleanning】With a upgraded removable full-opening water tank makes the cordless water flosser easily washable.It's convenient for you to clean the limescale and bacteria inside of the water tank. 【100% Quality Guarantee 】CE, ROHS and FDA approved with a 12 months warranty.